Homemade Soy Candles, and Natural Bath Confectionery. Created eco-fresh in our little kitchen! We are the home of 100% natural soy wax candles and homemade natural bath & body. Our products are lovingly handmade in our little kitchen. All of our soy candles are custom made fresh upon order to your specifications. We also have a large inventory of premade items for when you need something right away. Our pages are best enjoyed with a warm drink and a soy candle. Take your time and enjoy browsing our store. We offer only the best quality soy candles, using lead-free cotton wicks and 100% soy wax. We use top therapeutic grade essential oils, and phthalate-free premium fragrances to scent our products. We also offer pure and natural unscented candles for ambiant lighting and for those who are sensitive to scents. Each candle is handcrafted and hand poured into recycled or reclaimed containers. Our natural soy candles will add a peaceful glow to any home or office. 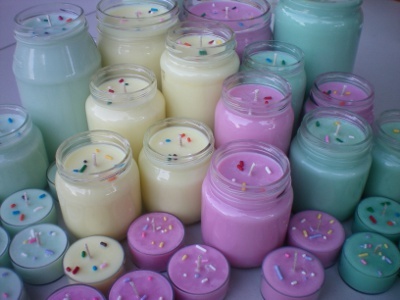 Our customers say these are the best homemade soy candles they have tried, and the repeat business speaks for itself. We promise you will be back for more! We are not in competition with famous candle brands. Free limited time shipping and free samples!